The Tarot Tour of London is the subject of tomorrow night's talk at South London Folklore Society. The person speaking is Geraldine Beskin of The Atlantis Bookshop - so it should be good. I'm really hoping to get to this talk as it is a subject I've thought about quite a bit myself. I've often looked for London imagery in existing tarot decks and even started to take photographs for my own personal Tarot of London. Although I didn't complete the Major Arcana, I did take a few pictures around town. 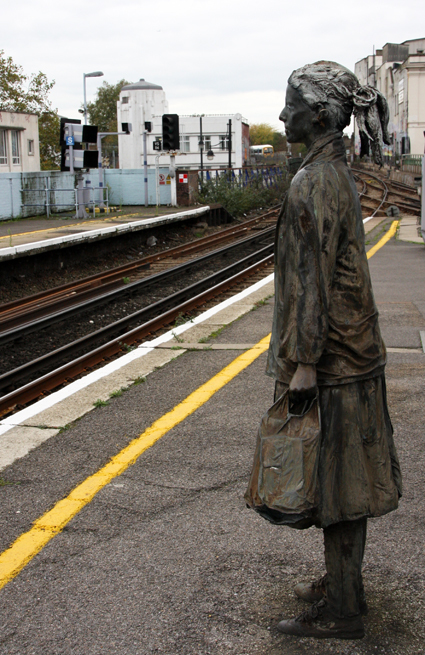 An idea I had for The Fool was one of the statues at Brixton station of a young woman looking as though she is about to embark on a journey (right). Most journeys into London - at least for me - start with standing on a platform waiting for a train. But, as the saying goes, you should always mind the gap - and that's the message of The Fool card too. I do think my first attempt at photographing the Brixton station statue is a little dull. If I was really to use it as The Fool in a proper deck there would probably need to be a nice little dog at the woman's feet, a brighter sky and maybe a train approaching. With existing tarot decks, the closest I have found to a genuine Tarot of London is the Sherlock Holmes Tarot. Most of the images are very clearly London scenes, as you might expect, although from Victorian times rather than any modern skyscrapers. The four cards pictured the top are just a few examples. Other decks in which I have found London images are The Guardian Angel Tarot, clearly showing Cheapside (midde right), and the Victorian Steampunk Tarot, with a structure that looks like Crystal Palace in the background (left). The real Crystal Palace burnt down in the 1930s, but it still remains an iconic image. The Fallen Angel Oracle, although not strictly a tarot deck, also has artwork that uses photographs taken in London, at Nunhead cemetery (bottom right). The Tarot Tour of London uses 22 of the major historical sites as the basis of the tour as they correspond with the Major Arcana. There are obvious ones like the Wheel of Fortune being represented by the London Eye and the Tower card by the Tower of London. Others are not so easy to presume as it is their history, myth, legend and folklore that makes them complement the meaning of a card. Geraldine Beskin of The Atlantis Bookshop is a Londoner and occultist and is delighted to combine the two as she presents the capital from a fresh, new angle.